Silvia Broome is a talented and gorgeous interpreter working at the United Nations in a quest for peace through non-violent means. Everything seems to be going just fine for our African-born beauty until one day when one of the metal detectors in the U.N. building malfunctions, forcing everyone to evacuate the building. This in itself isn't actually the problem, just a minor inconvenience, but when she goes back in to retrieve some her things she left behind, she happens to overhear part of a conversation... "It will end here. The teacher will never leave this room alive". Immediately afterwards, the florescent light in the room finally clicks on, revealing the fact that she is there. Scared, and unsure of what they meant, she keeps it to herself. The next morning she hops on her motorscooter as usual and heads to work, but on the way see is scared once again by someone seems to be following her way too closely. Then later, at the U.N., during a interpretation gig that happens to be in Ku, the same language in which the overheard conversation was in, she learns the Edmond Zuwanie, the dictator of Matobo, is referred to as the teacher. And this is where the plot starts to get going. Silvia tells the authorities what she has overheard, and they decide to assign secret service agents to protect her, and to uncover if she was really telling the truth about what she heard or if she is in fact herself involved in some sort of assassination plot. Why she would make something up like that is beyond me, but hey, there are a lot of crazy people out there. Okay, so this is where the movie goes and gets... different. Unlike most thrillers, there really isn't any more thrills until we get towards the end of the movie. No car chases, no shootouts, and no excitement. What we do get is some really good acting, and what feels like a much more realistic story. The secret service agents, Tobin Keller and his partner Dot Woods, take on the task of investigating Silvia, such as putting her through lie detector tests and digging up her past. If you like dramas, then you'll probably love this whole part. The characters all seemed to have some chemistry going, and I'm not talking about the generic falling-in-love scenario that happens in every single drama ever made. The characters are not one-dimensional, though they are fairly predictable, probably because they seem more like real people, and we know how real people act. After some time into the investigation they discover that Silvia has a brother, whom feels that diplomacy is too slow. We met at the very beginning of the movie, in the very first action sequence of the film. Of course, until we learn that he is her brother, we remain boggled as to what that whole action sequence had to do with anything. The action then picks up again once we get towards the end of the flick, though there still are no car chases or shootouts. You'll have to settle for one explosion and one gunshot. Despite this, the situation still feels very tense, thus making it seem like there's more action going on than there actually is. Apparently this is the first time a movie was allowed to film inside the United Nations building, so that was some kind of big deal. Sure, the place was very impressive, but I'm sure they could have put together a set had they needed to. The director made good use of his cinematographer both in the U.N. building and many places elsewhere in the film. I like good cinematography. Besides making the movie pleasent to look at, it also makes it easier to pick out good screenshots. So good looking, yes, but it just didn't have enough excitement to keep me hooked in all the way through, and it's like just over two hours long. I'm sure it could have been cut down by at least 10-20 minutes. Now, the bonus features on the DVD on the other hand, while not action-packed, were still enjoyable. Well, some of them. There are deleted scenes and an alternate ending, both of which weren't that great. Then there is the director talking about making the movie, the director talking about pan-and-scan versus widescreen, a little featurette about filming in the U.N., and my personal favorite, a little featurette about real-life interpreters. so wish I could speak multiple languages. That would just be so awesome. Anyway, those extras were all fun to watch, and didn't last for two freakin' hours! Oh, but sorry folks, there is no commentary. It's a shame, 'cause from the other extras, it seems like the director would have a lot to say. So there it is. If you like dramas, then you'll probably enjoy this one a lot. Otherwise, it's just alright. 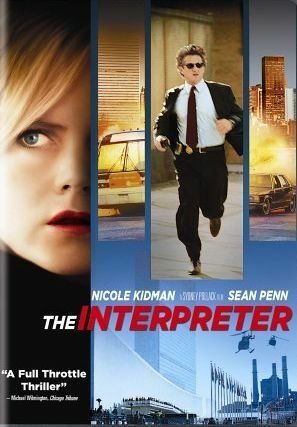 The Interpreter was released by Universal Studios Home Video on DVD on October 4, 2005. It was directed by Sydney Pollack, and stars Nicole Kidman as Silvia Broome, Sean Penn as Tobin Keller, and Catherine Keener as Dot Woods.